Last October I was walking through the Reston Town Center and there was a huge line of people coming out the door of a new little shop. It was the Red Velvet Cupcakery and they were giving away free cupcakes. I of course was skeptical that I would get one but sure enough they had a gluten and dairy free cupcake. I was too chicken to give it a try when they were free so I came back later when it was quiet and I could ask them my 20 questions. 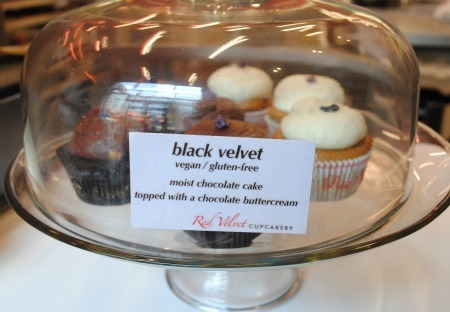 They seemed to know every answer without hesitation so I bought the only gluten and dairy free cupcake available at the time, the Black Velvet. This is the moist chocolate cake with the very generous portion of chocolate frosting on top that even dips into the cupcake to keep it from sliding off. Ever since then I’ve been hooked. Inspired by the first cupcakery ever opened, Sprinkles from California, the owners came east and opened Red Velvet Cupcakery. They have two shops in Washington, DC, one in Reston Virginia and two in Tucson Arizona. The Reston location is the one I frequent and where my pictures were taken. The head pastry chef is Ciji Russell and as you can see from my photos doesn’t sit down very often. She did sit for a few minutes with me as I asked her my 20 questions. Ciji is a graduate from CIA, the Culinary Institute of America, where they don’t mess around. The CIA has been around for more than six decades and sets the standards for professional culinary education. Ciji let me know that the gluten free cupcakes are the first batter batch made in the morning. These cupcakes are not baked until the next day when they are sold so they have time to set up. At the end of the day everything is wiped down and sterilized. This will mean it’s clean and ready for the next morning baking. The gluten free cupcakes have their own separate dedicated pans. One thing I did notice is that anytime I happen to go in and ask anyone working there questions, they all know what they are talking about. That is very reassuring that it’s not just Ciji who understands what should happen to keep the gluten free cupcakes safe, they all do. I can’t say enough about how key it is that the entire staff understand how to keep gluten free diners safe when they are eating in your establishment. When making cupcakes if they measure out any ingredients like cocoa and have extra it’s always marked not to be used for the gluten free cupcakes just to insure there is no question about cross contamination. There is no double dipping. They keep their ingredients clean and free of gluten. Of course this is a bakery and gluten flours are being used. This is something to be aware of. However I am very sensitive to gluten and a floured finger print would have me down and out. I’ve never had a problem with any of their gluten free cupcakes. Well, except maybe eating too many of them. They are really good. The store bakes daily for people walking in and they also cater. For my husband’s big birthday bash we ordered cupcakes for the dessert. We had the chocolate cake and chocolate icing and they also created a chocolate cake with vanilla icing for us. The ones with the vanilla icing were and still are our favorites. They do have a new vanilla cake with vanilla icing that is good too. As you can see the gluten free cupcakes are kept separate from the others. They have their own stand that is covered and off to the side. However when you order the cupcakes they are pulled from the rack. The gluten free cupcakes are always on the top of the rack to insure no crumbs fall onto them. They also always have a candied violet on top that is only for the gluten free cupcakes. So when you order one they will change gloves and then grab your cupcake from the top. It may appear that they didn’t even read anything to make sure it was gluten free. 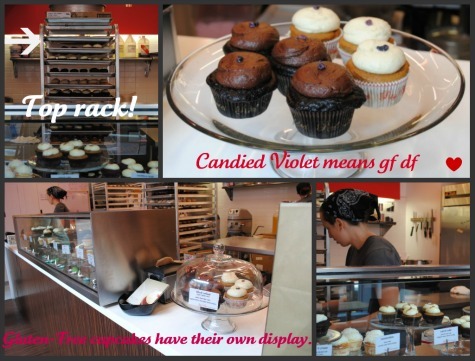 Their systems with those cupcakes on the top rack only and the candied violet mean they know exactly what they are giving you. Flavor to flavor comparison, Black Velvet gluten free compared to Devils Food Cake, they make about 1/3 the number of gluten cupcakes. That is around 2 dozen a day and it’s been steadily increasing over time. If you want more for your picnic, party or because today ends in a y, then order ahead. You can do that online or call. If I go into the Reston shop for my cupcake fix and you just cleaned them out I’m not going to be very happy. So far that’s never happened and I promise to not take the last one from you either. However once they get home this is usually what I’m left with, an empty box. 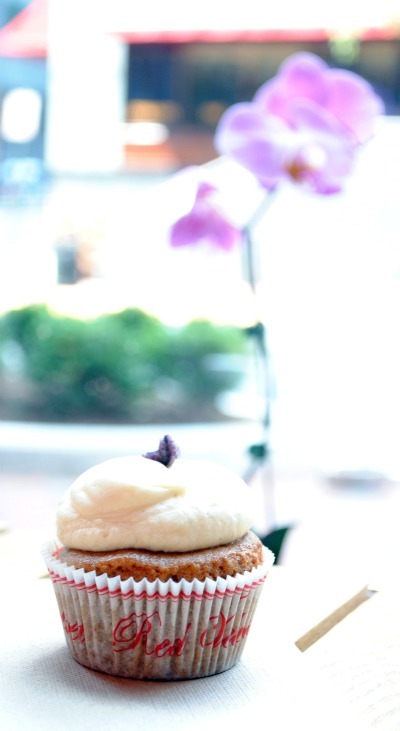 This Red Velvet Cupcakery is located in the Reston Town Center. Their phone number is 703-464-7075 and you can find them online for that special order. If you stop in or call tell Ciji hello let them know you read about their cupcakes here. And please keep asking for the chocolate cake with vanilla icing gluten-free vegan cupcakes. I’m hoping they will make that combo a regular. They actually have a couple of cupcake shops here with gluten-free offerings, but I haven't checked to see if they have dairy-free yet. So cool how shops are doing this now. Sounds like an awesome bakery! Wish there was one in Utah! Interesting post! I go to the Reston shop as well. I eat GF/DF due to other auto immune diseases (not celiac), so I'm not as careful with gluten as you are… but have you tried Sweetz Bakery? I'm not sure of their procedures, so make sure to ask your "20 questions"! They have a kiosk at Dulles Town Center. I think they're even better than Red Velvet and have a few more flavors. I just ordered a mix of GF/DF & regular cupcakes for my son's 2nd birthday!